Allan Kingdom, right, posted this photo on his Facebook page from the Brit Awards earlier today. The real-life Allan Kyariga -- a 21-year-old Woodbury High grad also known from the local quartet the Stnd4rd -- delivered two verses in “All Day” during the Brits, which RollingStone.com wrote up as the standout moment of the show under a re-stream of the entire telecast (West’s performance starts at the 1:47:50 mark). Here's the Ye clip off Vimeo. Kanye West - All Day Live from The BRIT Awards 2015 from Gabby on Vimeo. In the clip, you get a good glimpse of Allan delivering the refrain, “At the moment I disperse,” with a giant flamethrower going off behind him and footage of West’s new BFF Taylor Swift dancing along in the crowd at the 02 Arena. Conicidentally, New York singer/rapper Thelophious London is also featured in the performance, which explains why he cancelled Tuesday night's Minneapolis gig at the Fine Line. Hype for West’s new single has been pretty strong since an early version of it “leaked” a few weeks ago. It’s not yet clear when it will be formally released. His young protégé in the song has surprisingly kept mum about the collaboration in the meantime, and he didn’t even provide any hint he was headed to London today. He finally posted the above photo on his Facebook page this afternoon acknowledging the big gig. While he’s earned his local buzz mostly on his own -- including his win of City Pages’ Picked to Click poll last year -- Allan has made a lot of friends outside the Cities who’ve given him a leg up. He’s managed by Kid Cudi producer/cohort Plain Pat and worked on the Stand4rd record with Doc McKinney, producer for the Weeknd. 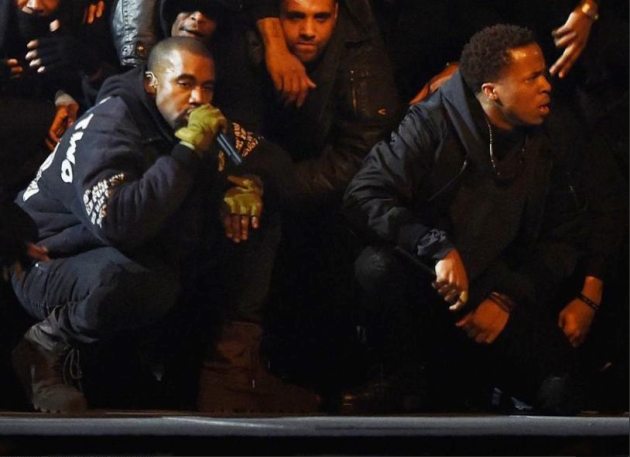 He probably came to the attention of West via Ye’s “creative director” Virgil Abloh, who was also already known to be in Allan’s corner. Who is Kevin Garnett's biggest fan? Is it our little Prince?